After cutting a few acres of invasive shrubs it is satisfying to clear away the brush and finally be able to see the lay of the land. It also feels good to warm oneself by a fire when doing this work in the cold months of the year. It seems a simple task, but there are many practical details to consider. Such as the precise location of the fire, what to burn and what to let rot, etc. As the crew of the Iron Creek Land Community has worked to restore this land over the years, we have also found that some of the basic manual labor tasks, when approached as an art, afford great opportunities for learning to read the landscape as a whole; and to meditate upon/discuss the deeper philosophical questions as to why we are doing this work. This presentation will cover both practical and philosophical lessons learned while dragging brush. Jeremy Siegrist has worked on the habitat restoration crew of the Iron Creek Land Community for the last 10 years in the Irish Hills of Southeast Michigan. 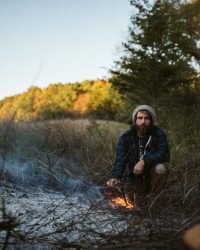 He lives on the land he works on and also spends time foraging for wild edibles, participating in bird and butterfly counts, and studying the local flora and fauna in general. He also helps put on community events with his neighbors, and performs music with his experimental folk orchestra theillalogicalspoon, as well as solo.